Laurie Wisbrun | Scarlet Fig: I llove llamas!! 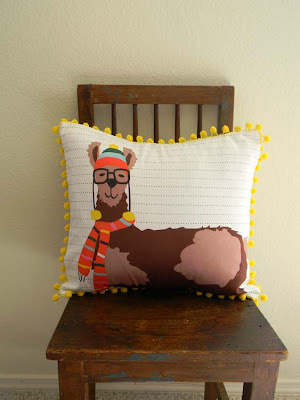 In my little corner of the world, February 1 is officially Llama Day. 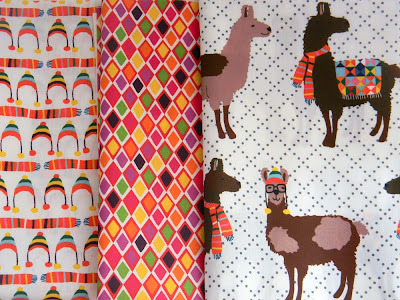 And what better way to celebrate Llama Day than to announce that the Llamas are officially available for sale in my shop! Yea!!! Let the Llama Llove begin! As always, if you need more yardage that what's listed in the store, message me and I can set up a listing for you. Love the hats too! !....That little lama is adorable! Oh my goodness....my 9 year old son is completely into llamas at the moment. He'd love this. You are hilarious. Llove the llamas. When we went to Chile for a month on honeymoon, we couldn't stop asking "como se llama, Llama?" We did a lot of 4-wheel back-roading in the altiplano and saw tons of llamas, alpacas and vicunas. They are definitely humourous animals; I bet they'd all be so jealous of your dapper fellow in specs and earflap hat! You'll like this - I teach international students and we were talking about the abbreviations we use in text/sms language. My Chinese students told me that the sound for 'F@!k You' is the same as the sound (although different characters) for 'Llama' ... so ... they send the word for Llama when they want to be rude! Isn't that brilliant. Now, whenever they are incredibly slow or unresponsive, or asleep I just get up, wordlessly draw a llama on the board, and sit down again! Works a treat to get them all engaged again ... and even more genius, to all intents and purposes, or prying observational eyes, I'm just innocently drawing a nice little cartoon of a llama on the board - genius! So, what I'm saying, is I'll have to nip over pdq and get some of this fab llama fabric and maybe make them all a little pre exam/leaving gift. Ooo La Llama! 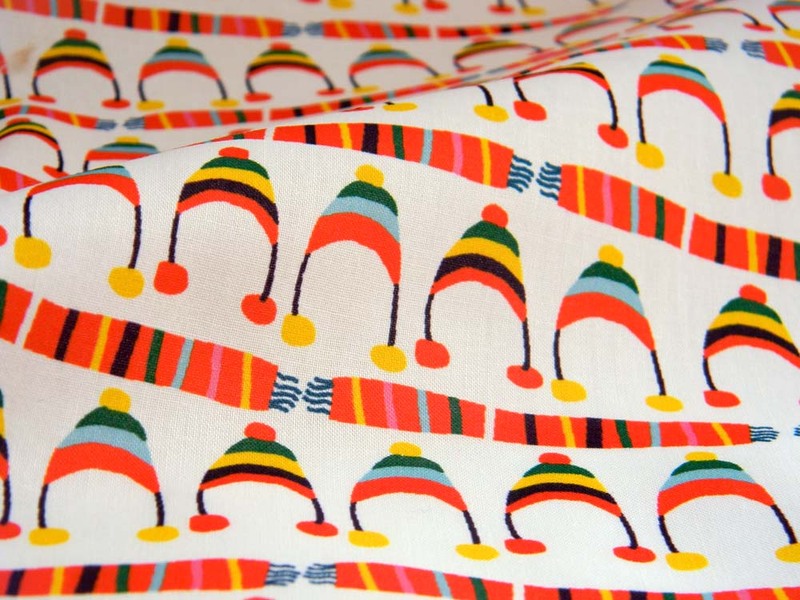 LOVE the pom pom fringe too. Yay! I bought some llamas! I have to say I got a good giggle out of this one. They are just one of those animals that make me do that. Yay!! Feeling lla llama llove!! I adore the "Where's Llama?" llama!! Hilarious! The are fantastic! Llamas are about the only thing we don't have on our farm!! Love it!! This is super cute, Laurie! Had to get this set! 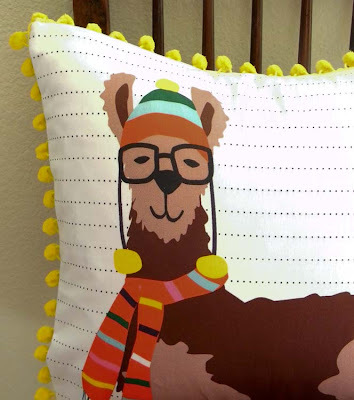 My DD's favorite series is the Llama Llama books by Anna Dewdney and she'll love a quilt made with them. So cute! wow! Your llama fabric is amazing! I can't wait for it to arrive. Book-bag for skater girl. Awhh! love at first sight!! 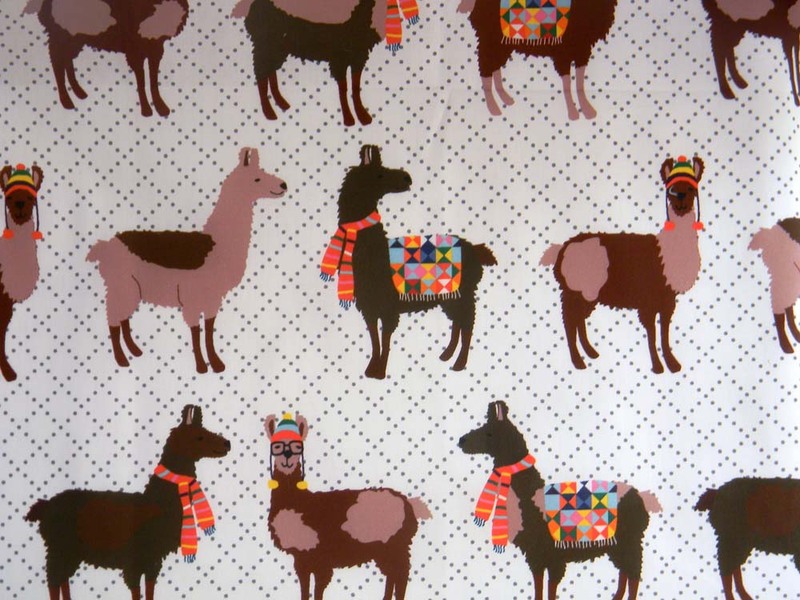 What a fun design, the llama with the chuyo is so cute!! I love llamas now too! 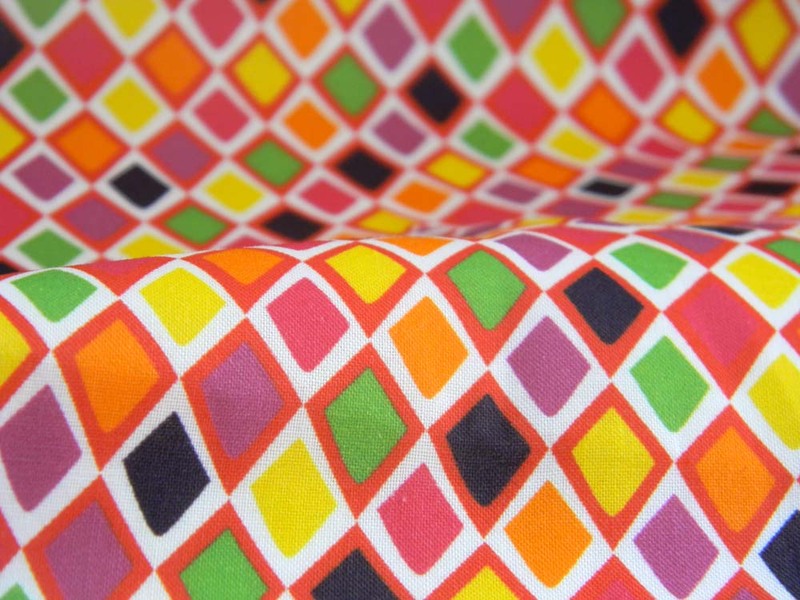 I have just found your lovely blog and adore your llama fabrics! Just finished my llama pillow and is it ever adorable! We have been raising llamas for about 25 years and I'm always looking for anything llama. Thanks for such a whimsical design. My son and his girlfriend spent last weekend at a llama bed and breakfast in Phillips, WI called Llama Kisses where you take care of the llamas, take the llamas trekking through the wood and all the llama kisses you want (kisses are free)! They fell in llove with the place and are planning on getting married there in the spring! 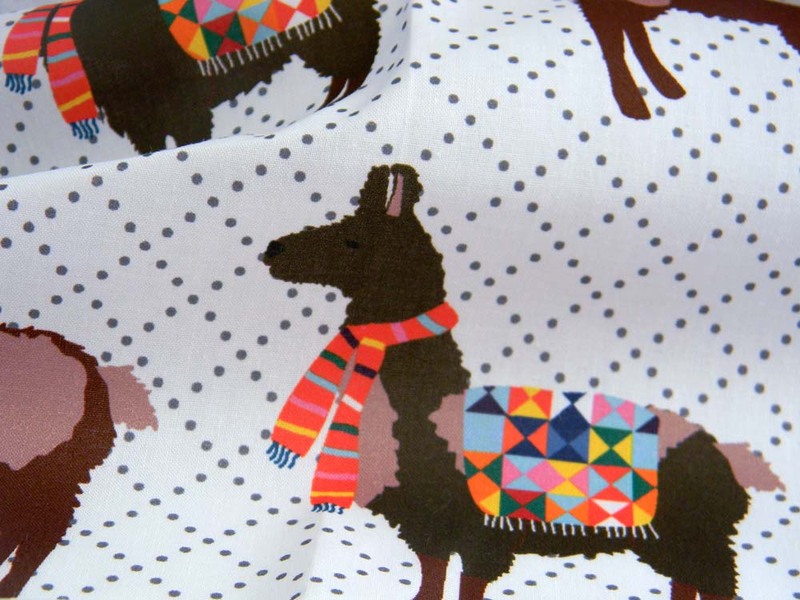 I am making them a I LLOVE LLAMAS quilt for a gift! 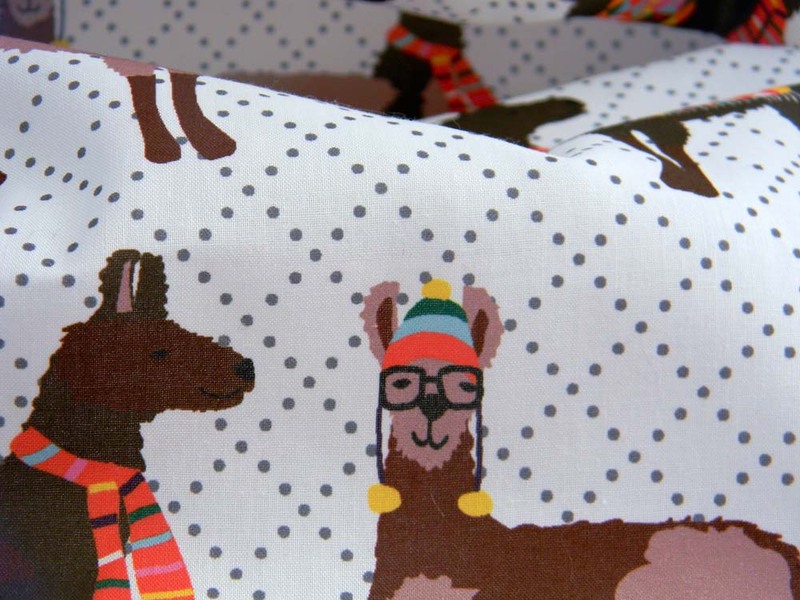 So happy I found your llama fabric! I just llove it!